Well, I was the first of 3 interviews and was told I would find out later tonight (my interview was at 4:30). I got a call around 7:30 telling me that I GOT THE JOB!!! I have spent so much of the past day and today being focused, I'm not even sure I know how to relax and celebrate. Seeing the happiness in my wife's eyes, made it very real to me. And yes I AM EXCITED about this. My Wife and I get to take lunches together, and carpool. I am very much in love with My Wife, and these little things mean the world to me. Well, today is Day 21 of the EA Active 30 Day Challenge. I have lost weight and more importantly, my BMI is just dropping. I feel better and find myself with so much more energy. Well, my Wife and I are both doing it, and we have good plan that will carry us for 6 months before having to repeat anything. Our plan (which we started day one when we got it) is to do the 30 Day Challenge on Easy, then we do 30 days of Preset and Custom Workouts (2 weeks of each); then do the 30 Day Challenge on Medium; then do 30 days of Preset and Custom on Medium; then do the 30 Day Challenge on Hard; then 30 days of Preset and Custom on Hard. Plus we're going to get wrist and ankle weights to progress as well. Oh, to anyone that is looking for a workout to create, feel free to copy mine. This one, I promise, will make you feel it. But it is fun. 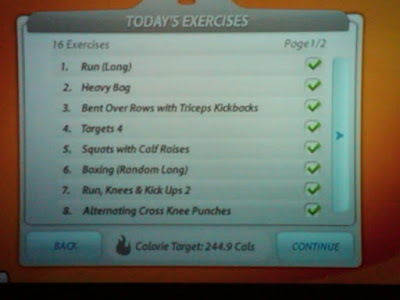 It is my own CQ's Custom Boxing Training Workout. 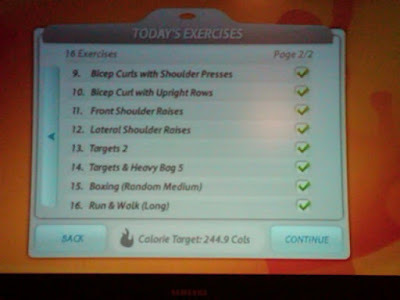 Here are screen shots of the exercises. Feel free to send my some of your workouts to me, and I will post my other ones later on as well. I think this is a great way for the EA Active-nation to interact and to keep the game fun and always interesting! !